Designer Tomáš Gabzdil Libertíny of Studio Libertiny collaborated with an army of bees to complete Thousand Years, his latest experimental beeswax sculpture. Commissioned by the French fine silver manufacturer Christofle, the large teapot-shaped vessel was created with the help of Dutch beekeeper Johan Beckers and his group of 60,000 bees. The unique work of art is a continuation of Libertíny’s fascination with harnessing the epic power of nature. To create the teapot shape, Libertíny constructed a metal scaffold that served as the framework for beehive before letting nature take over. The Thousand Years project took two takes to complete: the first attempt was unsuccessful due to a variety of factors including location and local weather conditions; the project was then moved to a less windy location near Rotterdam, where it was completed in August 2014. The success and beauty of the project is also a statement about the bee colony’s health and strength, as well as the quality of local flora; no bees were exploited or displaced. 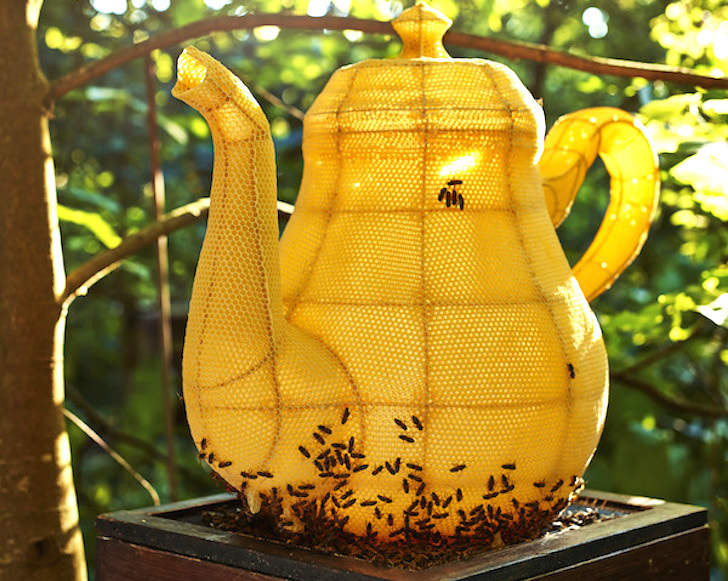 Related: These Amazing Honeycomb Sculptures Are Made by Bees! Does anyone know why the teapot shape was used ? Really bad taste and chocking to use bees in such a way. To create the teapot shape, Libertíny constructed a metal scaffold that served as the framework for beehive before letting nature take over. The success and beauty of the project is also a statement about the bee colony’s health and strength, as well as the quality of local flora; no bees were exploited or displaced. The Thousand Years project was inspired by Christofle’s collection as well as the themes on the passage of time and the power of nature found in the movie The Millennial Bee (1983) and Garcia Marques’ novel 100 Years of Solitude.